To be fair, I was out of ketosis when I started this challenge on Wednesday as I mentioned in my last post. 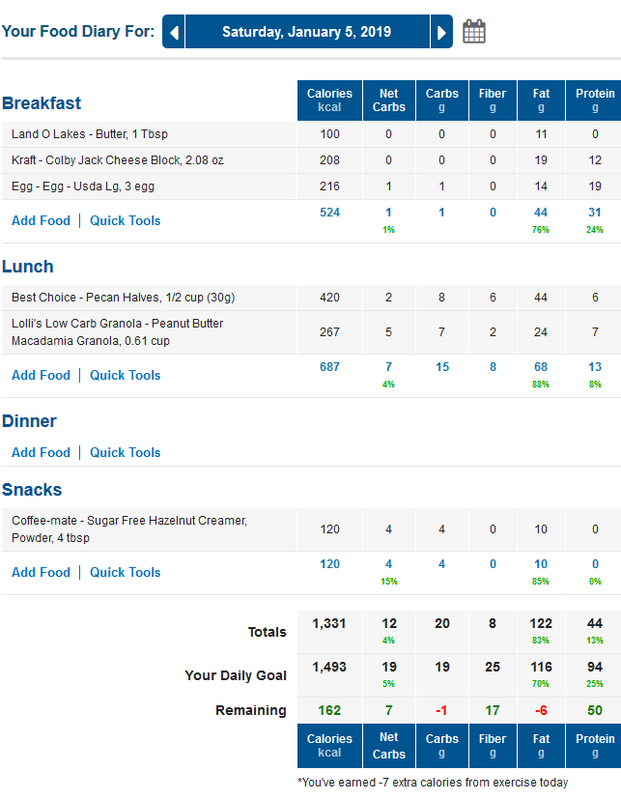 You can also see my first two days of food diaries in that post (Wednesday & Thursday’s meals) and my keto meals for Friday and Saturday are below. Being out of ketosis for me means instant water weight & bloating (which is the case for most people) – but also very uncomfortable swelling and inflammation because I use nutritional ketosis to alleviate chronic pain from a severe back injury. What is Ketosis and Keto Flu? By late Friday, Keto Flu had hit me HARD. I forgot how miserable that was, considering I generally just STAY in ketosis.  Ugh! That is the fastest I have EVER gotten back into ketosis, by the way – definitely record time as I mentioned in my last food diary. I melt a tablespoon of butter in a nonstick skillet over medium heat. I cube up colby jack cheese off the block, about half ounce per egg. 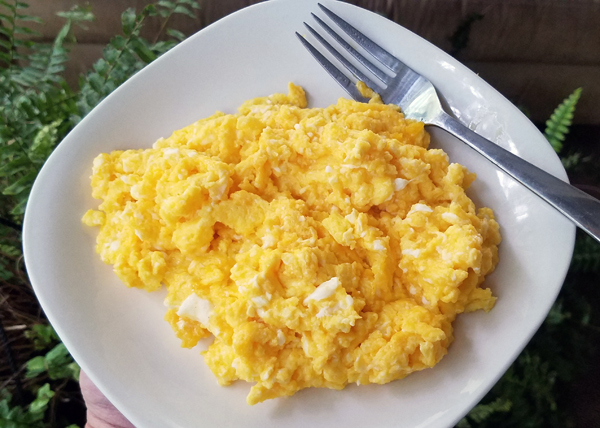 Crack the eggs into the melted butter and scramble them right in the skillet. Add the cheese about halfway through and finish scrambling over medium heat. 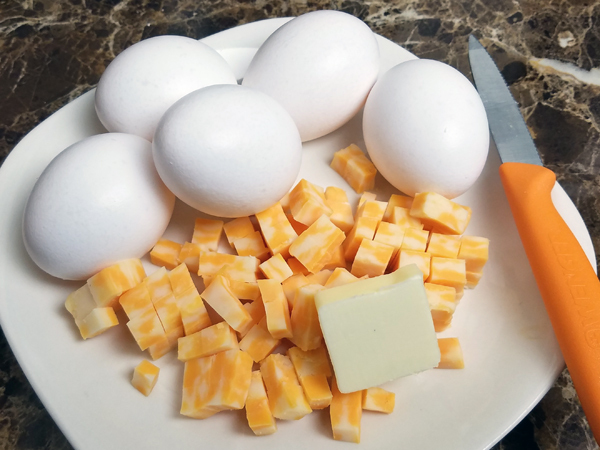 I can’t eat five eggs at once, so I made two smaller meals out of that! For dinner I put together a delicious bowl full of ketone-tested foods all combined into what tasted like PIE. 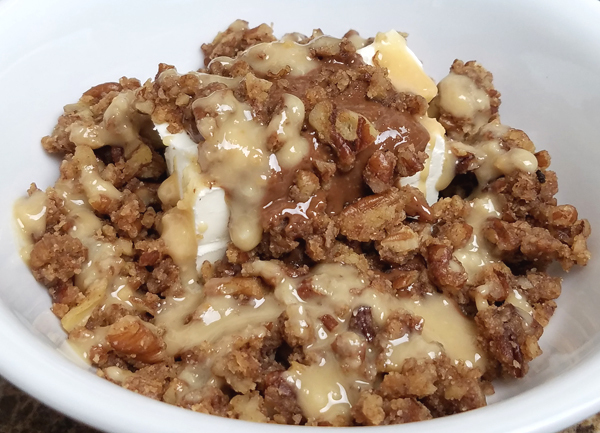 It’s Philadelphia “5 Simple Ingredients” cream cheese (1 carb for 2 ounces), Legendary Foods Peanut Butter Cup almond butter, Lolli’s Low Carb Granola – with FBOMB Macadamia Sea Salt nut butter drizzled over the top. This tasted like the BEST pie… with no baking! 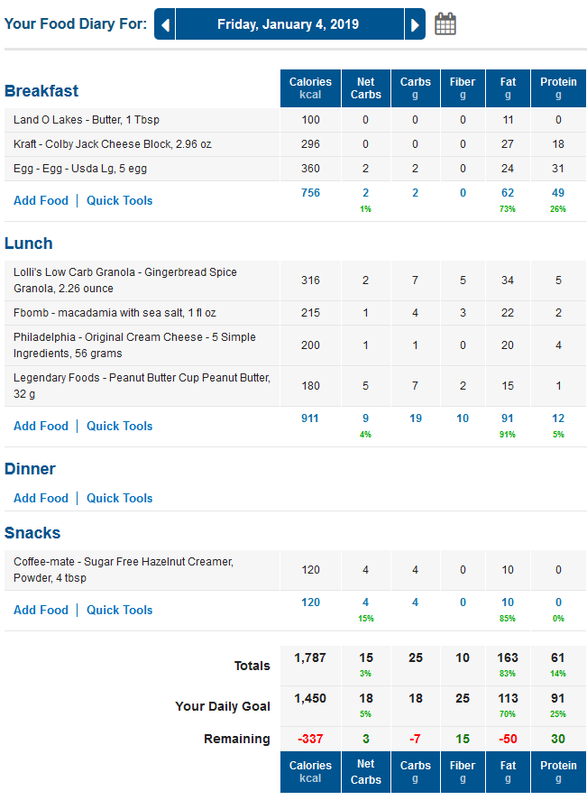 You’ll notice that Protein is only 14% of my total daily calories, yet I had 61 grams of protein. The recommended daily amount of protein for women is 46 grams a day. So while I’m eating “high fat” I’m also getting *plenty* of protein. I didn’t have much of an appetite on Saturday morning. Keto flu hit me HARD by Friday evening. 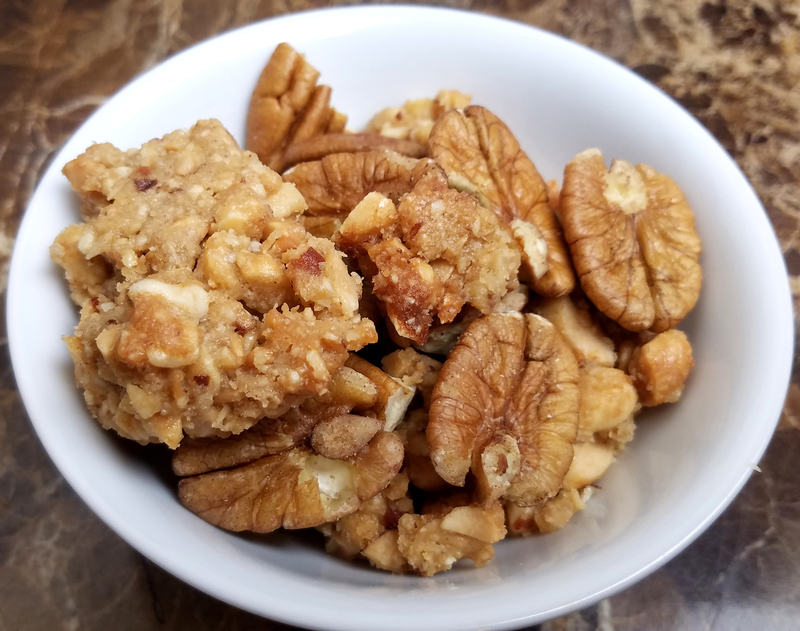 If you saw my last blog post you know I knocked myself out of ketosis for the January Keto Challenge. 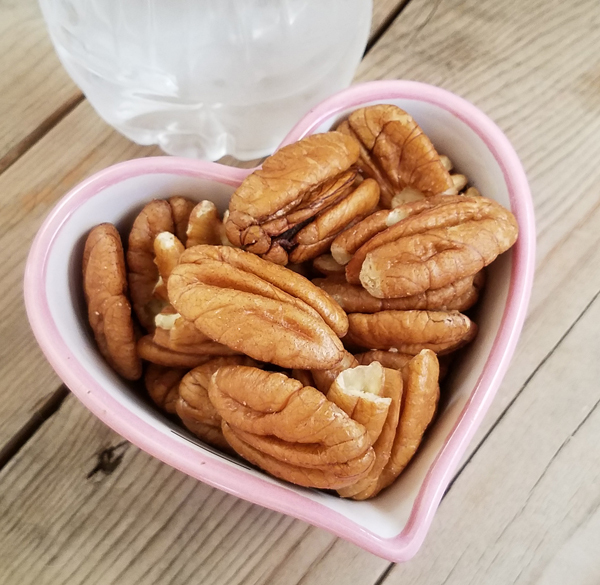 I had 60 grams of raw pecans plus water & coffee for breakfast, but couldn’t even finish that 1/2 cup of pecans. I finally made & ate some eggs around 8pm last night. 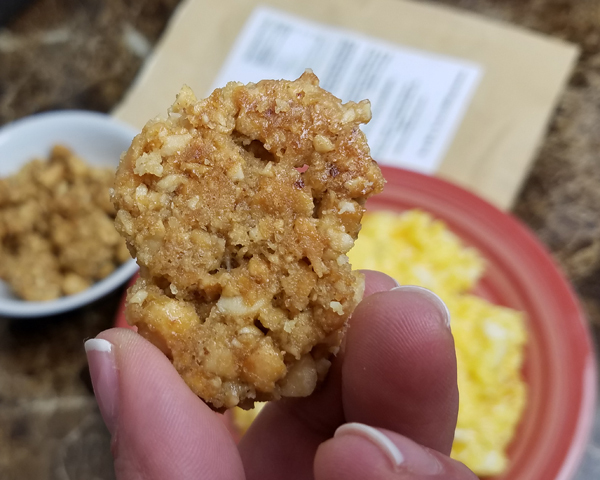 The Cinnamon Pecan Crunch is only 1 net carb per serving, and that plus the Peanut Butter Macadamia (shown here) are my two favorites so far. 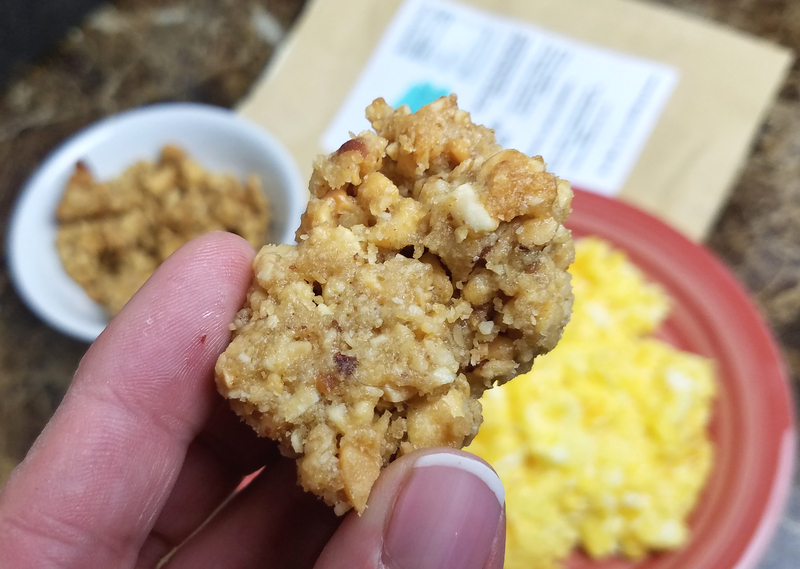 I love a “sweet n salty” combo, so salted almonds or macadamia nuts would be amazing mixed with these granola flavors! I had 4 coffee’s with Coffee-Mate Sugar Free Hazelnut Powdered Creamer again. Like I said, I started on Wednesday January 2nd out of ketosis. After two days (Wednesday and Thursday) I had dropped 2.6 pounds. Then after 4 days (Friday & Saturday) I had dropped a total of 5.6 pounds. 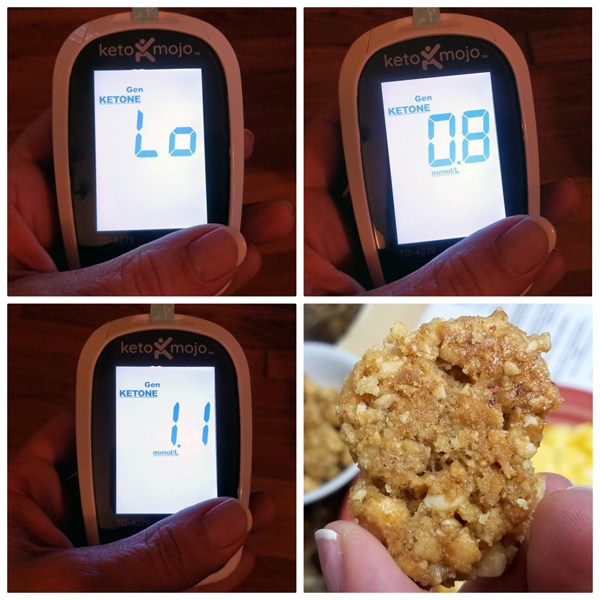 I use the Keto Mojo glucose/ketone testing meter. I have a 15% off discount link for us on that too. The discount is coded into my affiliate link here. I love this little keto gadget! My January Keto Krate box arrived yesterday! 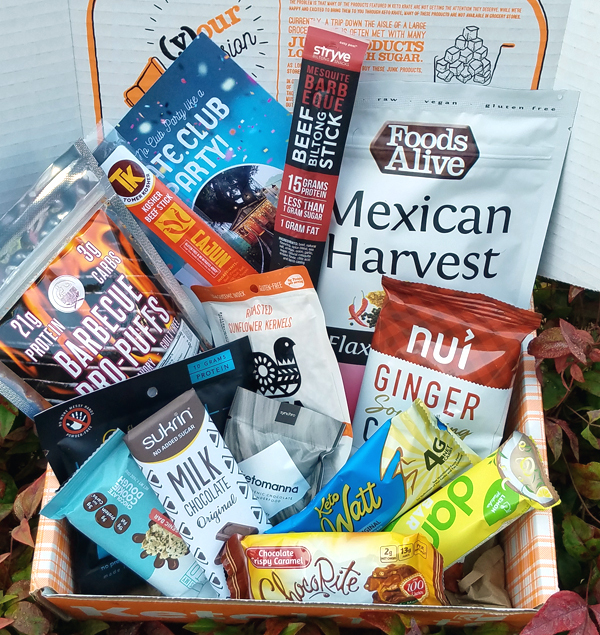 I’ll have to give you a breakdown of everything that’s in the box this month, and where you can get those keto snacks if you prefer to just order what you want to try instead of a box full of variety every month like this. 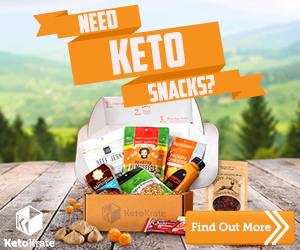 Learn more at Keto Krate – it’s so much fun to get a keto package every month!